I just finished and delivered this chair to my client. The back cushion was originally attached to the chair, so I detached it and used my trusty hot glue gun to attach the backing piece. She loved it! I have that same chai— different fabric but same style exactly. 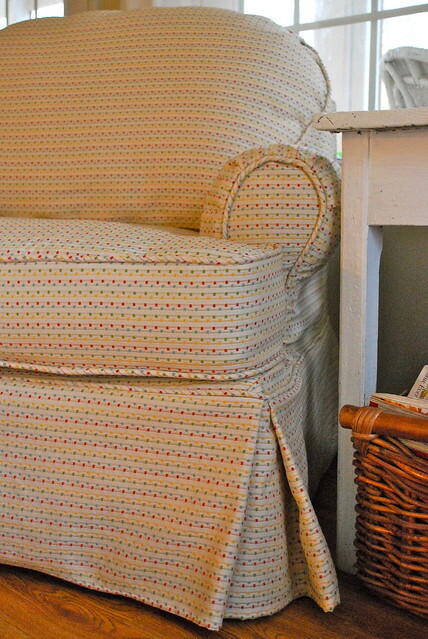 Mine, too, is in need of a slipcover but I have not yet gotten up the courage to do it, partly because I wasn't sure how to handle that back cushion. Did you leave it as a separate cushion? I can't even begin to tell you how happy I was when I read this post. I bought your LGGCS last year and then around Christmas time I found a cheap couch and loveseat off of CL to slipcover. I still have a chair, though, that matches our old leather couches that I just couldn't part with, but I know won't match my new look. It's one of those really big comfy chairs like the one you pictured, but the back cushion is really poofy and attached. I thought this might be a death sentence for slipping, but clearly, I am not as clever as you are. 😉 I think I may need a detailed tutorial so I can slip the chair after I do the couches. Thank you so much! I may not have to part with the most comfortable chair in the house after all! LOL I have slipped a love seat, wing chair and stool from your tutorial. I now have a couch for the Mom cave that I want to slip but it has attached back cushions I have been trying to figure out a way to do this and now you have the answer! Just need to get the courage to detach them. I also have a very large two person chair, very comfy! The back cushion if very slouchy though and I would like to firm it up a bit so that it holds it shape better. Any suggestions? I have two chairs that I've been carrying around with me for years to 4 different houses that I desperately want to recover. I even have the fabric! I just have never sewn in my entire life and I'm scared to death to attempt. But, I came across your site. Before I attempt to do this myself using your tutorial, how basic can my sewing skills be? LOL! You are an amazing and talented woman! Beautiful!! Thanks for the inspiration!